Poplar Creek Guesthouse B&B -This morning about seven while working on our computer I happened to glance out the office window and there was a moose enjoy some of the wild flowers in the yard. 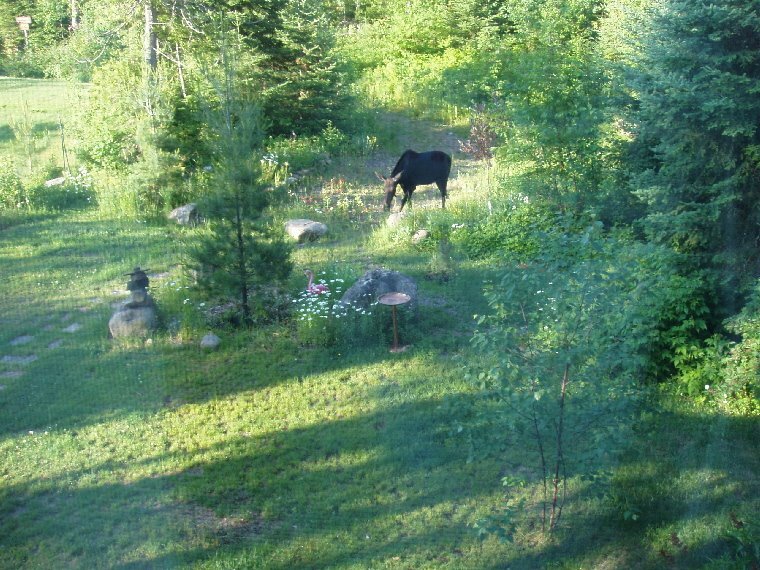 While moose wondering through the yard is a fairly common event, what was usual about today's moose was I was able to find my camera and get a picture of him before he wander off. Note- from this small picture you can not see the small nobs of a developing rack coming out of head, but they are there; it is a he-moose. Ely, Minnesota Bob Cary noted Ely author, sportsman and humorous passed-away. He was eighty four. While he wrote several book perhaps his most famous was The Root Beer Lady, the story of legendary woods woman Dorothy Molter who lived in the BWCA on Knife Lake. The Minneapolis Star Tribune in reporting is death describe how he moved to Ely from Chicago where had been a journalist, how he loved the outdoors and loved to fish. He fact Bob would say that "his trouble went away when he was fishing." The Tribune article failed to mention that bob was also an enthusiastic Nordic skier. As far back as anyone around Poplar Lake remembers, Poplar was noted for producing big lake trout. Then the walleyes came in and the lake trout began to disappear. It has always been my belief that sometime during the mid-1950's Ben Katzenmeyer caught the last lake trout out of Poplar Lake. Ben's cabin near Rockwood Lodge is now owned by the Moes. After sometime out on the lake the fishing party return with a large lake trout caught by the son. In fact the fish was large enough to enter it in the fishing contest sponsored by Midway Service Station, now Bucks Hardware. The fish even ended winning a prize for the biggest lake trout. By now the story was out about the Lake Trout from Poplar. Few, on the Gunflint Trail, could believed the trout came from Poplar. Even Justine Kerfoot and Janet Hanson, who as of yet had not met their new neighbors the Ekroots, came down from Gunflint to dispute the claim the fish was out of Poplar. However over tea, Char produced a photograph of the fish and informed Justine and Janet that the trout catching fishing party when they went out fishing went out by boat, no canoe to travel to any other lake and they did not leave Poplar by car to go to any other lake to fish. So it looks like my story about Poplar Lake's last lake trout needs to be corrected- the last lake trout was caught in Poplar not in the mid 1950's but in 1969. However, please let me know if you have another idea when the last lake trout was taken in Poplar. Perhaps there are other version as to when the last trout was really taken! USFS Dennis Nietzke, Gunflint District Ranger, and Patty Johnson, fire officer informed some twenty Trail residents on the District's planned prescribed burns proposed for this year's burning season. Among the most controversial of the burns current under consideration are the Meads Lakes, which the Banadad Ski Trail runs through, another burn around Seagull, which could burn much of the remaining unburned shore line around the lake and the burning of the Caribou Rock Trail. All these proposed burns are in the BWCA and they all would presumably be limited to blowdown "patch burns." While Nietzke argued that when they burns the blowdown within a patch, the fire tend to burn only up to the edge of the patch where the blowdown is located. Then of course Seagull's Three Mile Island was a "patch burn" and the whole island burnt. Nietzek explanation on this one was that, "the island burnt as we thought it would; not as we would have liked it to be." they could simply pulled back from the Trail and not ignite the "patches" on or near the Trail. When asked have they decided to do this yet both Johnson and Nietzke said no decision on this has been made; this despite the fact that the Meads Lake burn, as a proposed priority, could begin anytime and maybe within weeks. Many of the residents at the briefing were from Seagull and expressed concerned about another burn on their lake. Nietzke stated that they are re-examining the propose large Seagull burn and he has not yet decided what they are going to do - whether to not burn it at all, not burn along the lake or what or whatever. Nietzke had a similar answer about the proposed caribou Rock burn. He stated that they have reviewed that burn many time and are still trying to figure out how to conduct this burn with out destroying the caribou Rock Trail. Reforestation of the wilderness was another concerned express by several residents. Johnson had stated that when they burn the forest tend to regenerate with aspen, balsam and birch. Several in the audience added "and brush" and she reluctantly agreed. When asked how are they going to restore the white pine, spruce and cedar that are destroyed from their burning within the BWCA, Neitzky exclaimed that they are not allowed, under current legislated, to assist in the reforestation in anyway within the BWCA. While the burns are being conducted to protect Gunflint resident from wildfires, the question was raised, how much protects is enough. Jim Raml from Seagull state"if you carry this concern of protecting us from fires to its logical conclusion then you simply burn the forest and the threat will be gone- no forest no wildfire threat. This is not what I want but is this what you want?" It was also stated that people that choose to live in the forest have always faced the threat of wildfires For those that can not accept this perhaps they do not belong in the woods. Grand Marais, MN— The Gunflint Trail Association is pleased to announce the dates for the Third Annual Winter Tracks Festival. Planning has begun and the 2007 Winter Tracks Festival is March 1 – 4, 2007. This Festival continues to celebrate the best that Minnesota winter has to offer — in classic Gunflint Trail tradition. The Gunflint Trail, originally a footpath for Native Americans to get to Grand Marais, MN, is a 60 mile paved road that runs from Grand Marais, MN, to Saganaga Lake through the Superior National Forest. There are 600 lakes in the Gunflint region many bordering with Canada. The Gunflint Trail is rich in Minnesota history with fur trading, logging, prospecting and is one of the most significant, protected wilderness areas in the country. The 2006 Winter Tracks Festival was well attended by guests and residents. Activities throughout the festival included cross country skiing, snowshoeing, snowmobiling, dog sled rides, races and contests, seminars, guided hikes and tours, a variety of unique dining options and shopping. Events are for the entire family. New activities in 2007 will include skijoring and snow-shelter building. The festival is open to the public and guests of Gunflint Trail resorts, and most of the activities are offered free of charge to registered Winter Tracks participants. "This is classic winter fun at its finest," says Barbara Young, co-owner of Boundary Country Trekking and Winter Tracks coordinator. "There is something here for everyone. We realize that lots of folks need some how-to when it comes to the winter arts, so this year we are offering a variety of "intro to" events to get them started. All of us who live here love winter, and we want to share some of the fun and excitement with the rest of the world." The resorts and outfitters of the Gunflint Trail offer a variety of lodging options, plus dining, shopping and plenty of friendly hospitality. Visit http://wwwgunflint-trail.com to explore the options. The calendar for the 2007 events will be going up soon at http://www.wintertracks.com. The Gunflint Trail Scenic Byway committee is cordinating the Annual Gunflint Trail clean-up. The DNR's proposed clear cut along the Gunflint Trail received media coverage from Duluth, to the Twin Cities and beyond. John Myers', article in the Duluth News Tribune was subsequently picked up by the St Paul Pioneer Press, Fargo Forum, WCCO-TV and Kare-11 TV. Locally the Cook County News Herald ran an article on the Clear Cut on the Front page. The Cook County Star placed the story in less prominate position.